PhotoWings founder Suzie Katz urges that lessons from photography and the thinking behind it are far more universal and compelling than we realize. Photoville, the largest annual photography festival of its kind in New York City, opens this week for its seventh year. Photographer Suzie Katz loves the festival because it’s not like going to a fine art gallery. 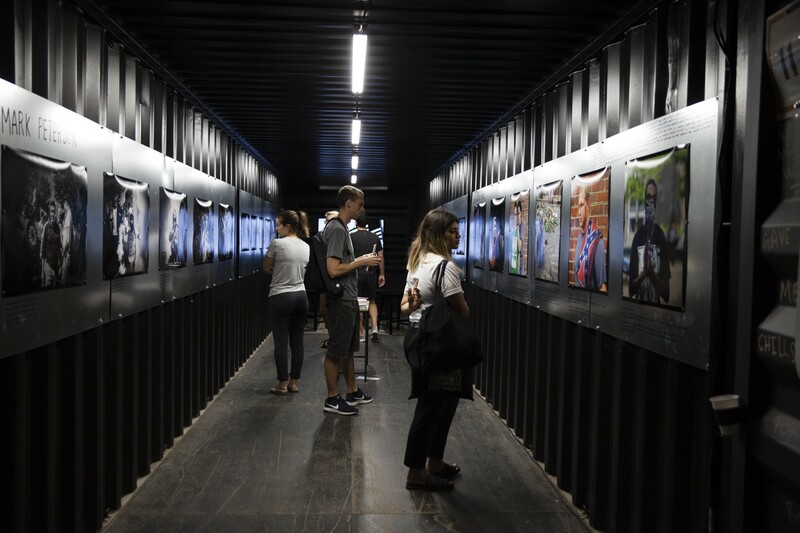 Admission is free and, as attendees weave through the shipping containers turned galleries, they can interact with many of the photographers on-site. Katz is one of Photoville’s partners, but her main passion is to find ways to reach people who can’t make it to the festival — or to any festival. “It never made sense to me for only 30 people who happened to be in the room to be the only ones to benefit from that knowledge,” Katz says. Driven by memories of a lack of opportunity when she was young and years of working as a freelance photographer, in 2005 Katz started PhotoWings. Through the non-profit, Katz and her team find ways to help society further and fully benefit from photography. For example, last year PhotoWings filmed talks and panel discussion at Photoville and made them available online for free. They will do this again this year. During Photoville 2017, PhotoWings filmed a panel discussion of the founding members of Reclaim, six organizations committed to amplifying the voices of underrepresented photographers and decolonizing the photojournalism industry. On the Photowings website you’ll find dozens of in-depth and often exclusive interviews with photographers, photo editors, and even psychologists talking about photography. The videos emphasize the thought process behind the photographs — like synthesizing complex ideas into stories, earning trust, and talking to strangers. Katz says it’s these concepts that make photographers’ experiences interesting to anyone, regardless of their background. Katz’s influences come from her time at TED conferences, Renaissance Weekends, rubbing elbows with curators in the fine art world, Ashoka, Jeffersonian dinners, the Aspen Ideas Festival, and even her childhood love of show-and-tell. PhotoWings spent the day with photojournalist Andrea Bruce while in Bali for the 2015 Foundry Photojournalism Workshop, another of its partners. When Katz founded PhotoWings, she wanted to do something a little different than funding individual photographers through grants. Instead, Katz uses lessons from photographers and photography to create understanding and awareness. To do that, PhotoWings partners with established organizations that Katz says have “ripples” beyond the photo industry. 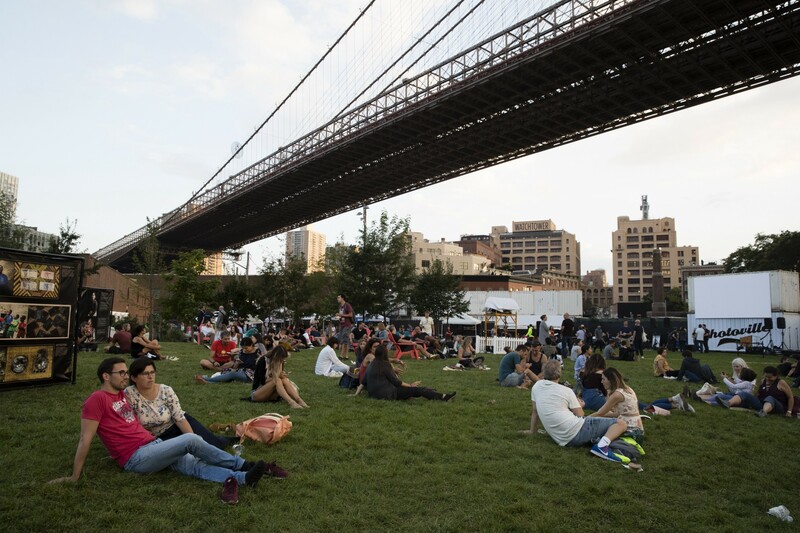 “For example, a huge percentage of the people who go to Photoville are not professional photographers,” Katz says. Katz likes learning as much as looking, and for her Photoville is about far more than looking at images. She values talking to photographers and connecting to causes and action. At the PhotoWings tent, you will find photographers from several of PhotoWings’ partners engaging in portfolio reviews and giving presentations on their work and projects. Peter DiCampo talks about how Everyday Africa and The Everyday Projects use photography to show a more accurate view of daily life than what is commonly seen in the media. In addition to Photoville, PhotoWings partners with several other organizations, including The Everyday Projects (which publishes Re-Picture) and Dublin City University, where students and the elderly use personal photographs as a starting point for inter-generational conversation. While Katz says she’s been a photographer her whole life, she was reminded of the power of photography in an unlikely place. In the early 2000s, her late husband was in and out of the hospital for four years. Katz put together several photos from throughout his life, creating what she calls a memory board. The photos were meant to cheer him up, but, to her surprise, the photos made his health care providers see him as more than a just sick man in a hospital bed. The photos humanized him and sparked storytelling that led to meaning and connection. Suzie Katz shares her personal story of how photography helped her, her husband, and their friends and family during his challenging illness. As the world modernizes, she still believes photography is one of the best teachers of critical thinking and, ultimately, self-discovery. Look for Suzie Katz at Photoville in the PhotoWings tent and attend her panel discussion “The Importance and How To’s of Archiving Work and Legacy” on Friday, September 14, at 60 Water Street in DUMBO. Learn more about PhotoWings’ partnership with Photoville, including a list of scheduled speakers and portfolio reviews at this year’s festival, and videos of talks and panels from last year’s festival. Watch more videos produced by the PhotoWings team.